OpKey allows you to execute your Test Case file, Function Library file, Test Suite file and Gherkin file by clicking on ‘Run Now’ or ‘Debug Now’ button. You need to follow few simple steps for execution. Usually, Run Now is used for execution but you can use Debug Now as well, which is mostly used by developers in order to quickly debug the issue. When execution gets completed, you can go to the Execution Result and analyze your result. 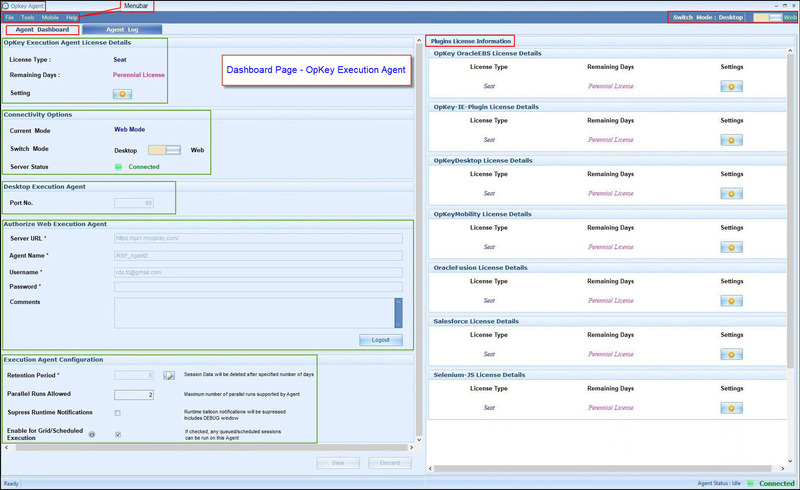 Before running execution on OpKey (Web), you need to configure OpKey Execution Agent. Switch Toggle button from Desktop to Web mode. Enter Server URL, Agent name, Username and Password > Click Login. A popup message appears as shown below. Click on Yes to relaunch the OpKey Agent and reflect made changes. Go to Project Workspace > Select your test script file to be executed > Click on Run Now. Execute Now Wizard opens. Fill data in all required fields as shown below. You can create or choose build. 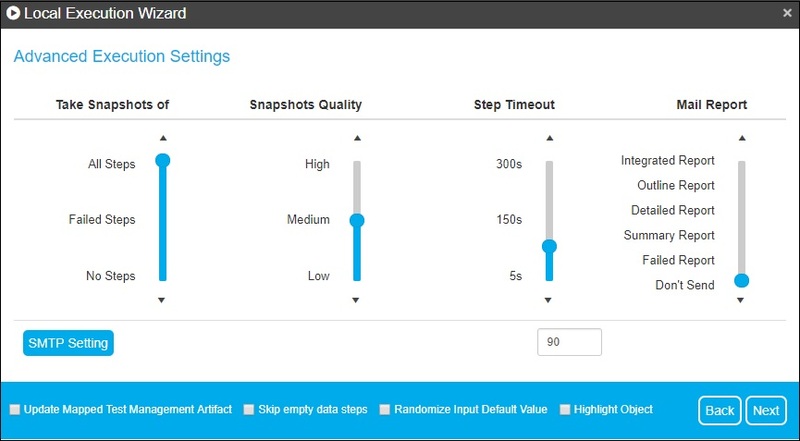 You can select “Show Advanced Settings” checkbox which helps you configure Snapshot of steps (along with quality and step timeout), session tags and global variables. Set advanced execution settings from here & click on Next. You can now set an option Highlight Object under Advanced Execution Wizard as shown in above image. It highlights objects before performing action on it during test execution. This feature is now available only with Selenium-JS plugin only. Thus, you can easily identify the object on which action is being performed during test execution using Selenium-JS. Here, you can add session’s tags which helps you to recognize your sessions from execution result quickly and easily. Click on Next to proceed. If you want to change or modify any of the global variables, used in your test script, then you can do it from below displayed screen. You can edit desired global variable and click on Finish to proceed. Just after few seconds, you get a message that your execution started successfully. Further, you can see the execution process running on your screen. Go to Project Workspace > Select your test script file to be executed > Click on Debug Now. It is an alternative way of execution which allows developers to execute test and debug existing bugs quickly and easily. Click on Debug Now button and follow steps which are similar to the execution through Run Now. When execution though Debug now gets completed, you can go through the execution result which contains detailed logs about all the steps.With the help of these logs, developer can easily analyze bugs and debug them as well. Execute Now Wizard opens. Fill data in all required fields as shown below. You can create or choose build. You can select “Show Advanced Settings'” checkbox which helps you configure Snapshot of steps (along with quality and step timeout), session tags and global variables. Debug Now is similar to Run Now way of execution, the only difference is in the display of execution result & logs. Now, OpKey users can execute their Suite based on tags added to the Function Libraries (added to Test Cases which are further added to the Suite). This feature is very useful in case you want to replace the execution of mapped Function Library with another Function Library having similar Tags, name & other parameters. Suppose there is a Suite (name Suite-1) which has a Test Case (name TC-1) and this Test Case has multiple Function Libraries (FL1, FL2 & FL3) with tags (Tag-1, Tag-2 & Tag3) as per the build version. Suppose you are ready to release a new build of new version and there is a Function Library (name FL3, not mapped with TC) having the similar tags, values, input parameters etc. and you want to execute this new Function Library while replacing the FL3 (added in TC & TC mapped with the Suite) then you can click on the Run with Tag version button and select the Tag & respective value of the mapped Function Library. In this case, it will skip the execution of mapped Function Library and will execute the corresponding Function Library existing in Project workspace having similar tags, values, input parameters etc. Thus, you need not to open the Suite, its Test Case and Function Libraries and replace old Function Library with new one automatically. Let us create a Suite by adding Test Cases. Here, you can see that there is a new button added in Suite as Run with Tag Version. Click on Run with Tag Version button. Tag Version popup window opens. Select Tag & corresponding value from the dropdown. Click on OK to proceed test execution based on selected tag version. 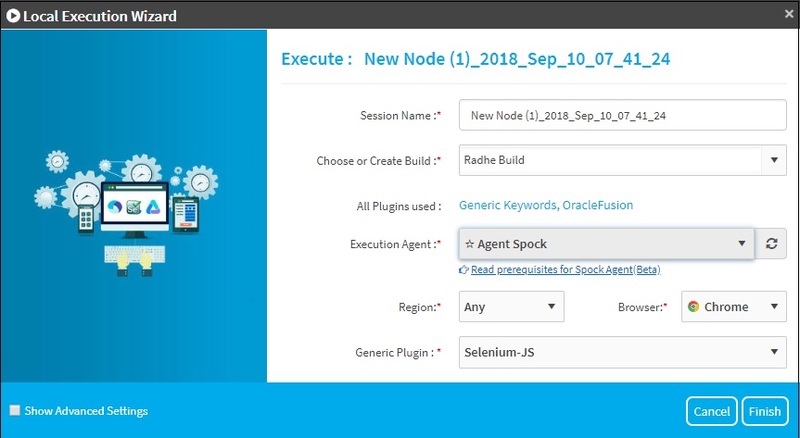 There is a Cloud based agent named as Spock Agent in OpKey which enables you to execute your test execution on this cloud agent. It is visible on the Local Execution Wizard. You can select Any, India or United States based cloud agent from the Region option and browser (Chrome, Fire or IE) from the Browser option. 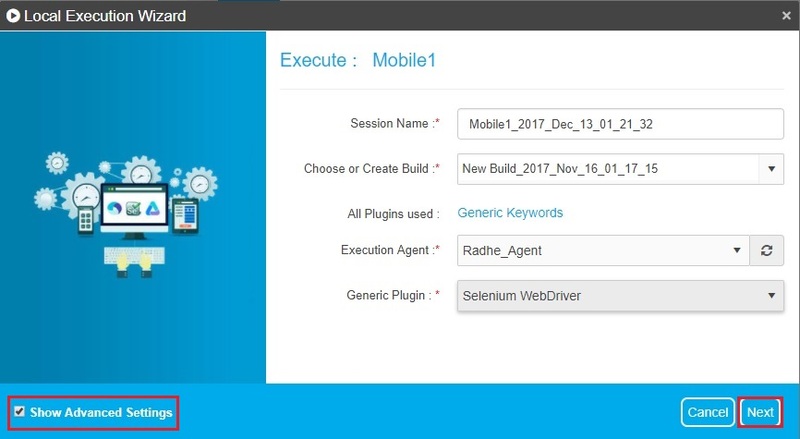 Once you triggered test execution in this way, the execution will be performed on the chosen cloud agent but the live execution on the browser will be performed on your system. This cloud agent has been created for our new users so that initial agent downloading and installation process can be eliminated. Select Spock Agent from the dropdown list of Execution Agent. Region & Browser options appears. Select Region and Browser type from the dropdown list. OpKeyTeleportingTunnel jar file is downloading. Once, it gets downloaded successfully, keep it and launch to establish a secure connection between server & your local machine for test execution. In case OpKey Teleporting Tunnel jar file is already downloaded then you need to click on “Open OpKeyTeleportingTunnelLauncher” tab to launch OpKeyTeleportingTunnel. You can mark Always open these types of links in the associated app checkbox which will launch OpKeyTeleporting Tunnel automatically. OpKey Spock Agent (cloud agent) now supports test execution on the locally hosted OpKey Web. If you need to use Spock Agent then contact with our OpKey support team (support@opkey.com). OpKey support team with coordinate with you and install Spock Agent in your locally hosted OpKey environment.